Otavio (Tavinho Teixeira) and Gilda (Ana Luiza Rios) are a very wealthy couple of the Brazilian elite who have the habit of eating other people whom they lure to their gated country home. 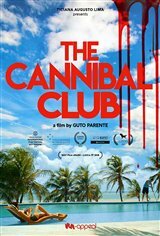 Otavio owns a private security company and is a notable member of The Cannibal Club. When Gilda accidentally witnesses something she shouldn't have seen, that involves Borges (Pedro Domingues), a powerful congressman and the Club's leader, it puts both Otavio and Gilda's lives in danger.